When I got busy with school, I always thought there were enough people and momentum to keep F31club moving. It did for a bit. The hacks, social media groups, the economy, gas prices… I can’t pinpoint when, but there was progressive downward spiral. 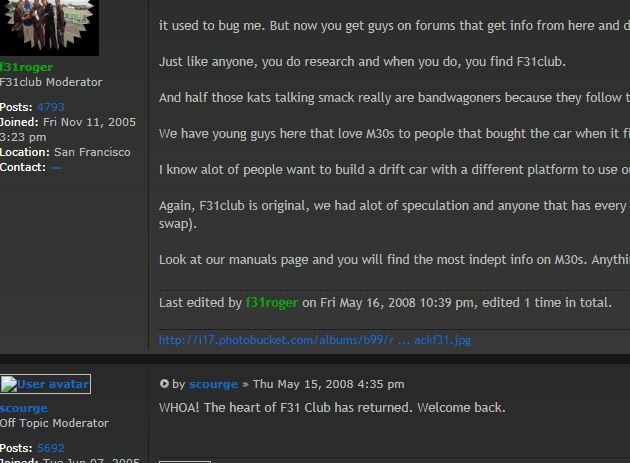 When I got F31club backup, it was the forums and I wanted to get in touch with everyone that was on it. I started by listing everyone I had met and was in contact with. Some of the guys I connected on Facebook. Prior. But I wanted to find our tech moderators. Nyeark, F31_Pilot and Brewster240. 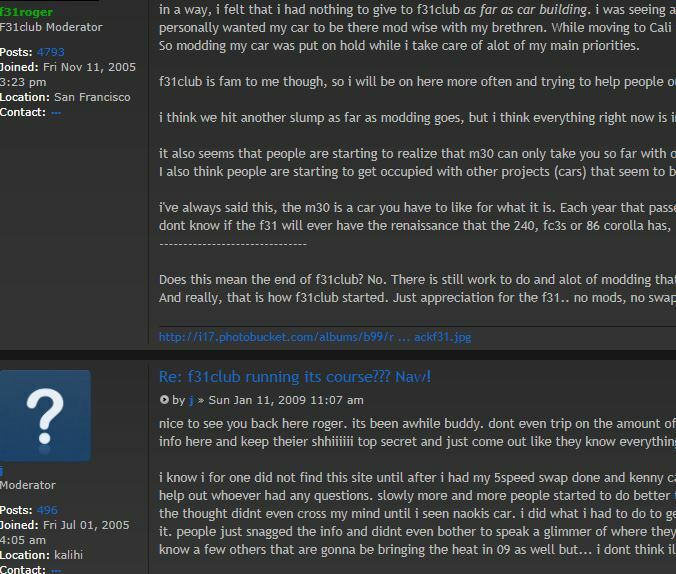 It was a stroke of luck and timing when Nyeark and F31_Pilot posted back up on the forums. A few others did too. Now, I felt I had to reach out to them and see how they were doing. I also wanted to tell them I appreciated and respected their participation and that F31club wouldn’t be anything without their contribution. I also told them I wanted to reach out and with no obligation to F31club, I just wanted to say whats up. Some of the guys I have always been in contact with or we linked up on Facebook/IG and just kept in contact. I started to do some detective work. So I REREAD a good amount of the forums. Often times people would use the same screen name on other forums, so I ended searching and googling those names. This is how I found a good percentage of the people. I would get their name and look on social media. It is how I found Brewster240, Squid636, Zoltecrules… It lead me to a youtube or facebook account and I would send them a message. Other’s checked up on the site and sent me an email or responded to a post. A few others I got in contact with by a mutual friend. I also went on some Facebook pages asking about a few people. The interesting thing was that many of these pages are full of new owners and many of them don’t use forums. In 2004/5, I reached out to the Japanese Leopard owners. While many of us visited the various club pages and personal homepages and checked out their pictures, I contacted them and attempted to bridge the F31 community. Simasima (White Zenki with Blue racing stripes) was the first. But also Yokota and Yousuke-san from Specialty emailed. Noguchi and Tanaka-san actually registered and posted on the forums. The phpbb format is different than in Japan that uses a bbs style communication board. Noguchi and Tanaka-san I conversed with on facebook. Actually Tanaka-san came up to me at the 30th annual leopard meeting and told me I emailed him 10 years ago. Noguchi-san actually contacted Jacy for the F31club stickers. At the 30th leopard meeting, I started to talk to Uchida-san asking questions. I then found some old emails from Yokota and Yousuke-san. To my surprise, Yokota-san was already my FB friend and also he was at the 30th meeting. Yousuke-san I had requested as a friend, but was waiting approval. I sent a copy of the email to both of them and they replied back. I felt I needed to reach out and give my respects and catch up. Many of the members on the forum always showed love and respect. Reading many of those comments, I felt I at the very least say whats up. Scourge has always given me props. But he’s the catalyst that made people think about M30s. Eduardo is my brother! I am hoping to get in touch with him soon! J (Jason) has always been a big part of F31club. He is a pioneer and a big part of F31club’s drifting aspect. I’ve always felt F31club’s core group was like a family. 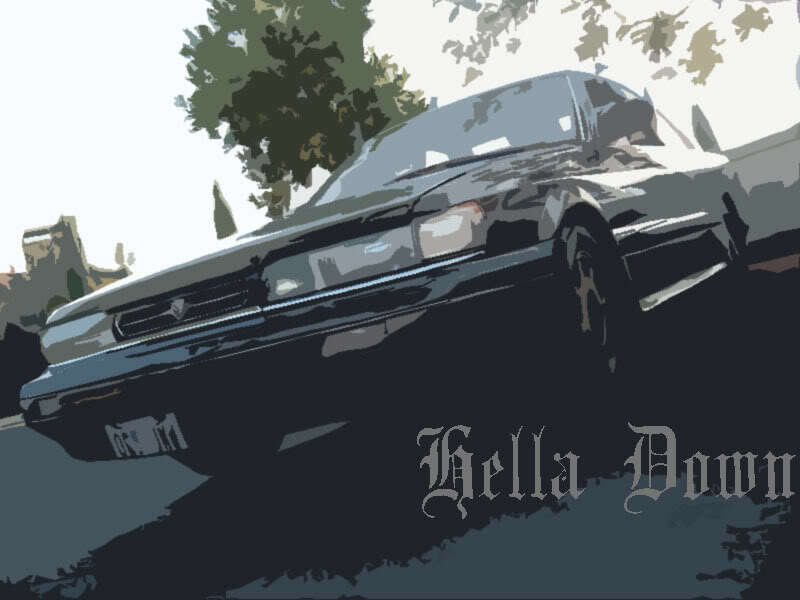 Many of us were the biggest M30 advocates on other forums. When someone would “build an M30” and not give credit to where they got all the info from, it was obvious, people called them out. Many of us made F31club our home for a bit. I realize that I do miss that group of guys and the dedication, respect and helpfulness that made F31club great for small forum. This entry was posted in blog, history, opinion.